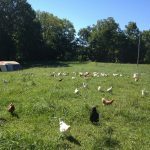 Our flock of 100+ hens and 2 roosters, Clarence and Pip, roam the pasture feasting on grass, bugs, worms, and whatever other treats they can find. 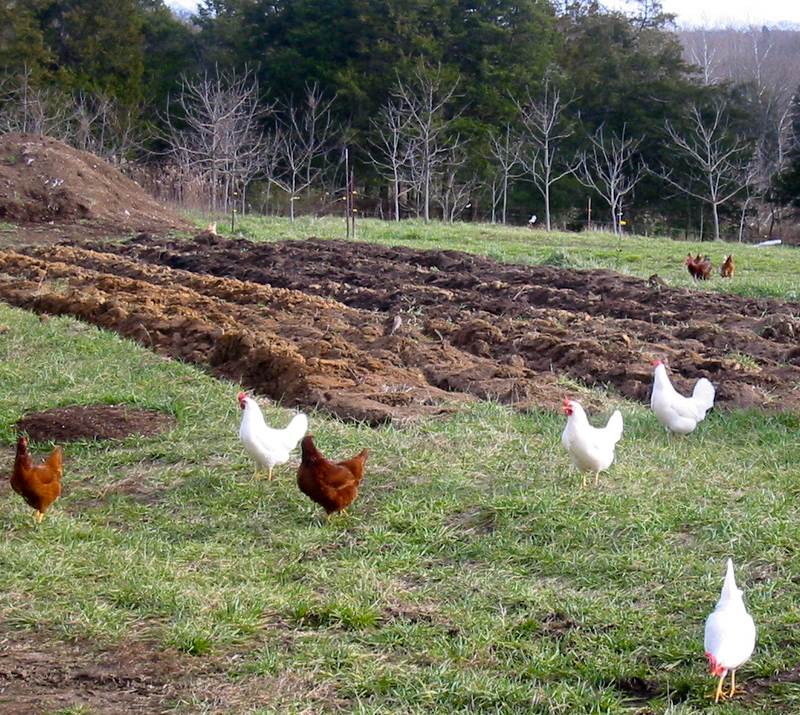 We rotate through different heritage breeds such as Rhode Island Red, New Hampshire, and Delaware hens. 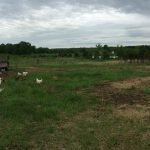 The girls stay on pasture in a movable coop within an acre paddock. We provide a calcium supplement for them and our non-GMO custom ration mix. 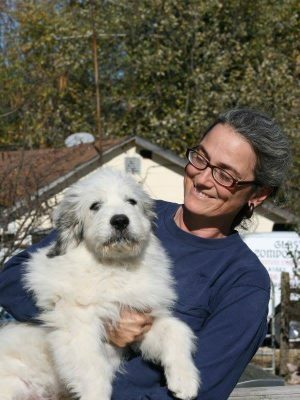 Maxie and Zeke, our Great Pyrenees, stay in their area when not guarding the meat birds. 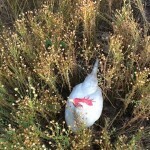 Eggs from a happy pasture raised chicken are different from store bought in many ways. They actually taste like something…an egg. Store bought eggs are bland and rubbery when cooked. Pastured yolks are bright orange/yellow, not the pale yellow of store bought. No matter how good it may sound, chickens are NOT vegetarians by nature. Store bought eggs are usually from chickens fed only grains. 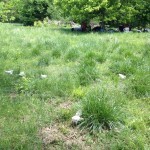 Pasture raised chickens eat what they are meant to eat…bugs, worms, slugs, frogs, snakes, grass. THIS is what makes the eggs taste sooooo good! Once you have an egg from a happy chicken who is raised on a natural diet, you will never want a store bought egg again. Foraging their own flax seed. 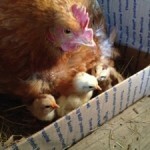 We love to let the mommas raise their own chicks to get new layers. One month old Delawares that escaped their enclosure to get to the pasture. 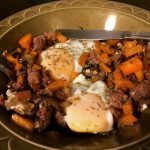 Eggs with sweet potato sausage hash for a quick and healthy dinner. Cleaning up the cattle’s winter hay feeding fields.